This is a simple carry on bag that will be checked so that I don’t even have to think of lifting it up. All I have to do is get it zipped and wheel it into the airport…..and then wheel it out and into the back of a car in Hobart. And I will be in Hobart one week from today. A friend there will relieve me of some of the contents and get them to where we meet up later. This time I have packed more presents, more small books for the marketing stall at Halls Gap, more things that older women need to look and feel better, and less clothes to make room for it all. 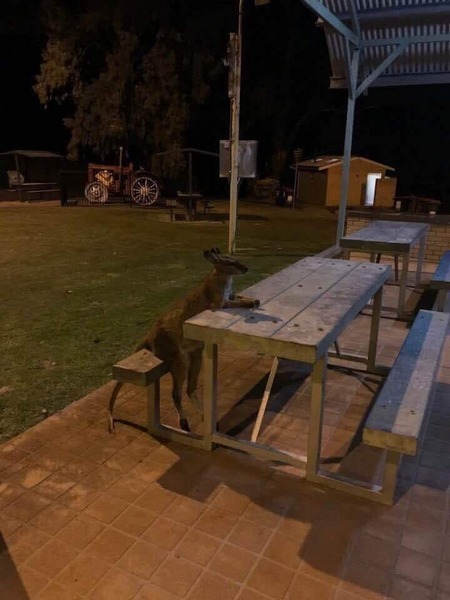 I think of this little fellow as a companion who is waiting for me to come join him. Really cute photo. The sun has come out for a bit today. The crow has moved to smearing up another window so more rags need to be draped in front. The studio needs a bit of a pick up before I leave. Lots of post-a-notes need to be added around the house for the temporary care givers. I need to be mindful of all the small things I do automatically and remember that no one else is aware of how and when they need to be done. 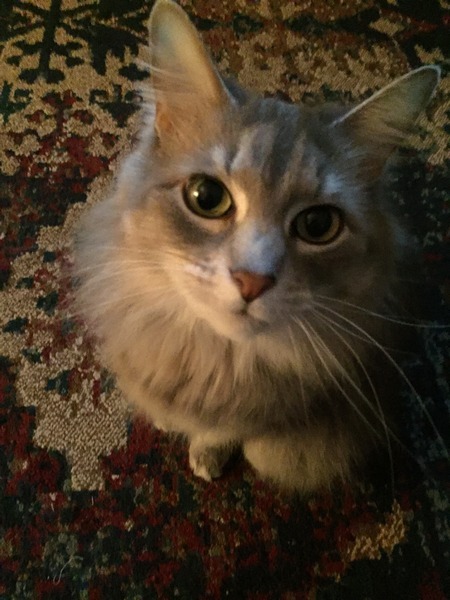 I have bought extra cat litter, extra laundry detergent, extra cat food, extra corn for the deer, extra bird seed, extra favorite foods of Lees, and extra wine. Now I need to go over all the phone numbers the care givers will need to have access to, legal papers, cash for small expenses, envelopes of cash for the cleaning lady, and whatever else I can think of before Thursday. And another thing I just thought of…..last night I photographed each step of putting a DVD into the player and how to turn it on. Now just to put them all in order with words on a print out near the TV. Lee and I might just be the last people around who do not stream and actually get DVDs in the mail! 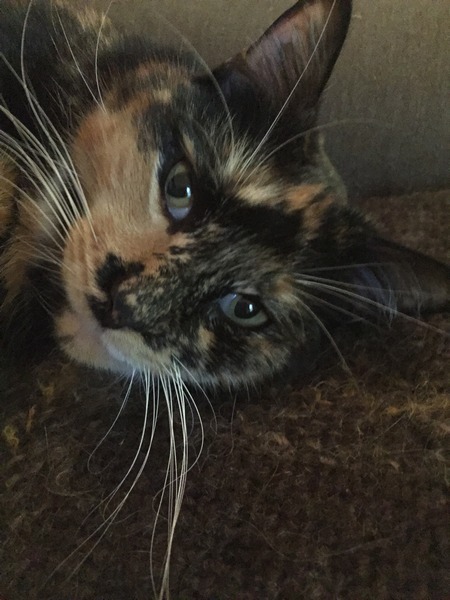 I will miss the cats. I have been stitching up a storm while sitting with Lee. So far I have six completed folios with patched bits on each of the four sides. I am even taking a worn thin shirt that a friend in Australia gave to me and hope to find patches from friends to sew onto it while down under. Another way to bring them home with me. That is it for now I think. I need to go collect my thoughts and get out those bright colored pads of post-a-notes. 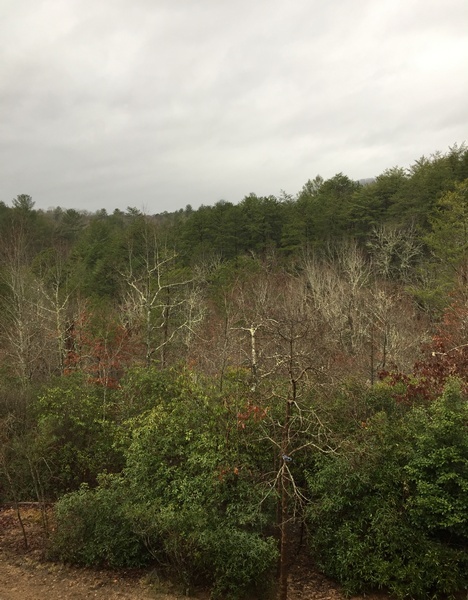 This is the view out the dining room window….day after day after day after…. So I went outside to find the beautiful details of what so much rain can do. 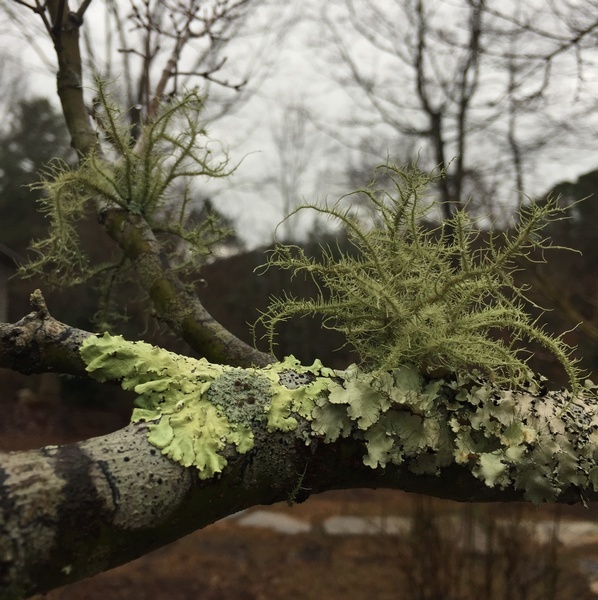 Lichen! I really love this last image. 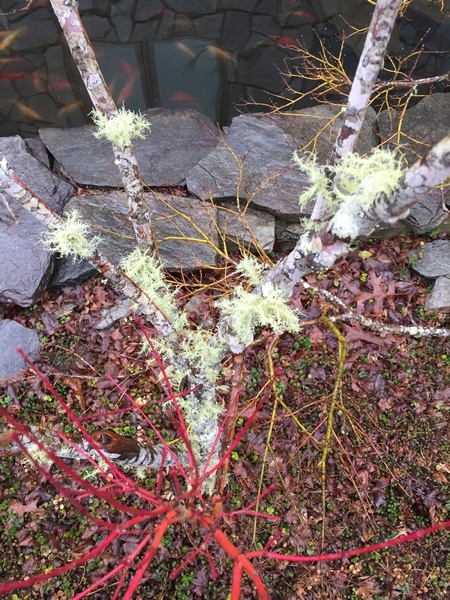 Only some of the Japanese maples have lichen like this on them….many others do not. Must have something to do with the bark. You see that light blueish green color there? It is the exact color of an Italian green earth pigment that a friend found for me at the Rembrandt Museum. Such a nice thoughtful gift to get yesterday. Lee received a jar of Sir Basil’s Marmalade. The same friend does our Costco shopping on his way from the airport to Brasstown whenever he comes this way. Two to three times a year we get household necessities in bulk thanks to him. The stitching goes on at a frantic pace this past week. Forget that “slow stitching” idea. Once threaded and pinned why wait? So far I have three folios completed on both sides. And the front side of another folio is finished. On some of these pages I am using a cloth that Philomena Hali dyed with the soils of Alice Springs. 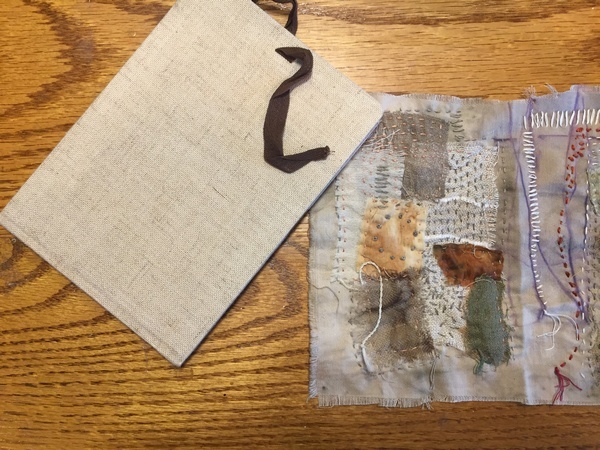 She gave me a strip of the cloth and I used an image of it in my Earthen Pigments book…then of course stored it away til later. It is now later and makes a nice background for my scraps of cloth. I like how they all feel when folded and stacked one on top of the other. So a book of them is most likely. The suitcase for Australia is getting fuller by the minute. It is a carry on size but I always check it because of the tools, etc that travel with me. I may have to add some poplar boards for the white line printmaking class. The only wood that works well over there is a very expensive Japanese magnolia sold in print making supply stores. Most of the printmakers I follow down under are using linoleum for block prints. And that just will not work for the white line technique. The quandary is that I do not want Lee using the table saw at this point and I am scared to death of that finger-eating machine. My son will be here the night before I leave so maybe he will cut up the boards for me and they can be sanded when I get there. I also might just enlarge my carry on bag to put clothes in. I really hate looking like a helpless old lady who can’t get her bag stuffed in the overhead. 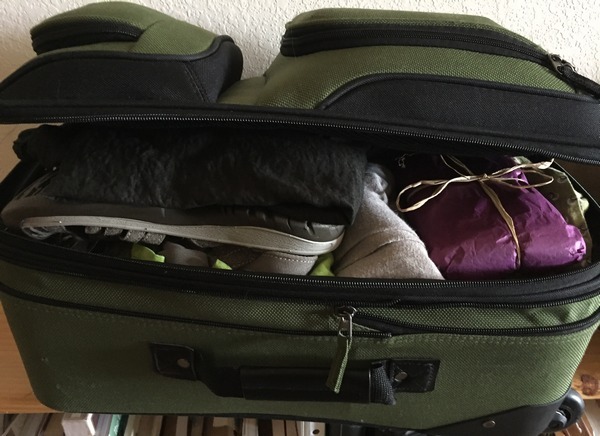 It is time to get serious about that packing and stop putting it off. Two weeks from today I will be in Hobart, Tasmania with all my bits and pieces still with me until a friend puts me and them in her car to head to Halls Gap. And when I am there I take advantage of the Post Office to ship things home that will not fit into my bags. The stupid crow is still banging on the guest room window. I will find something to hang there so that those coming to stay with Lee are not disturbed too much. Scraps of cloth should do it in lieu of a scarecrow. Not much else new here…..just getting fidgety…..well more fidgety. 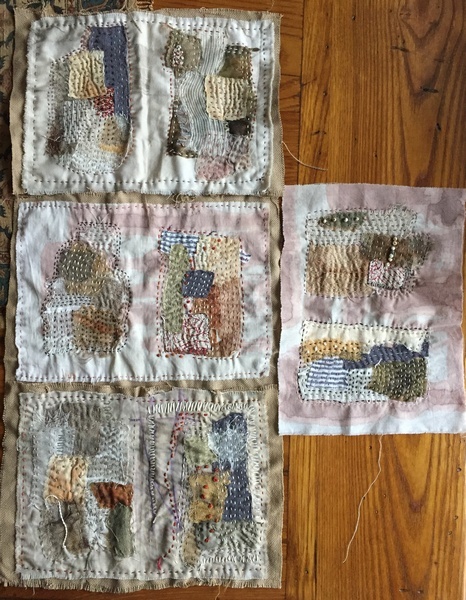 I am compulsively stitching away on those small folios of cloth. Each half of the folio is viewed as a page. So I compose some scraps of cloth on one side and then stitch them all into place. Then add more stitching before moving over to the other side. Next I do the same on the slightly larger cloth so I can stitch them back to back. This photo was taken just before I stitched it to the other one below. 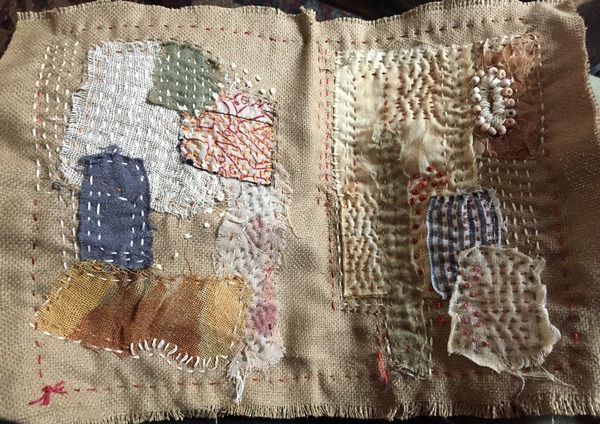 And then after I stitched on a new folio I went back to the patchwork on the left above and stitched some more. It is so thick with layers of cloth that hardly any stitches went through to the other side. Here is the starting point of the next one. 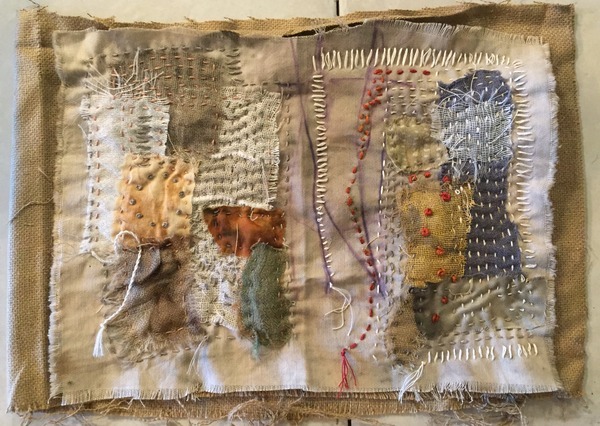 There is a group that calls itself “Slow Stitching”. I do not know how they do this slowly. Granted my work might (maybe) look better if I was slower but I just keep going to get a section finished as soon as possible and have no idea why. And sometimes the quickness results in having to put another piece of cloth over the really ugly bits and stitching that into place. 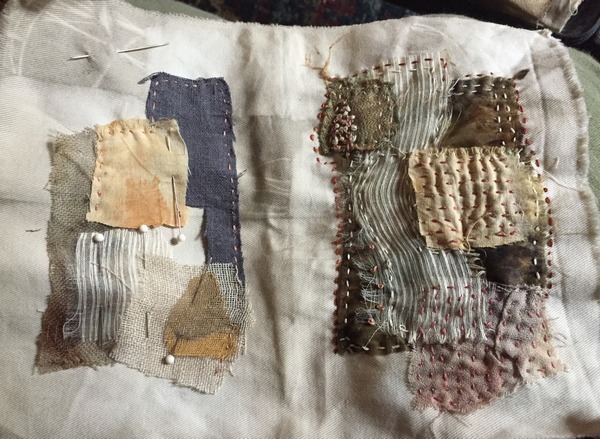 Yesterday to slow myself down I undid lengths of the embroidery threads in the pouch and then split them into thinner strand sections…..some with two and some with three. Then I wrapped these into butterflies and placed them dark to light in the pouch. And all that does is let me go faster because I just have to grab one, shake it out, thread it through the needle and keep going. What I do like is how these small bits feel in the hand. If I made a blanket out of all these scraps and covered myself up, I may not get out of bed. I haven’t started writing in the journal. I can’t do that while watching crime shows with Lee in the den….but I can sew these folios. And maybe that is why they go so fast…because of the pace of the same stories told with different bad guys running from the same cops. To write I need dreary days and quiet. 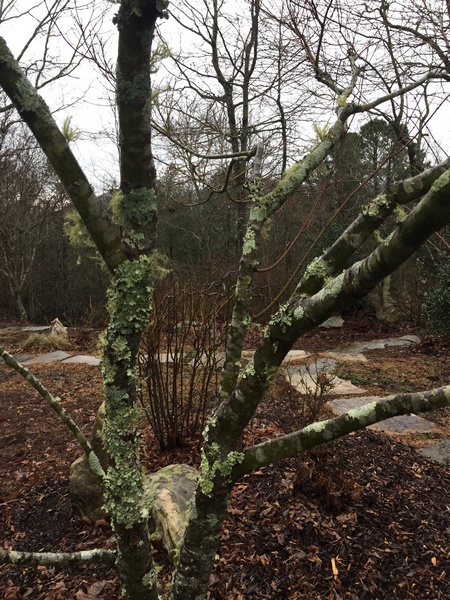 Dreary is no problem as we are in a continual state of cloudiness and rain. But quiet? I can only get that in the studio. The studio with holes in the ceiling, books that are crying out to be given away, empty surfaces with nothing exciting started, a suitcase too small to hold all the bits I want to pack for Australia, a space that calls me to return to the tai chi and yoga poses I gave up a year ago because they take concentration and clear headedness. My computer does not even like that word “headedness”. So since I am not getting much cooperation down here in the studio OR office, I am going back upstairs to watch more bad guys and stitch. And maybe, just maybe, if I look over and Lee is napping, I will take out the journal and jot something down after I mute the bad guys. Well instead of thinking I had to make a special container, I found these. They are a set of small travel bags that I bought at a Kathmandu store in Salamanca in Hobart Tasmania. They fitted inside one another and were easy to purchase and pack in my suitcase. The only other thing I bought at that store was a shirt. The clothes at a Kathmandu store are for hikers and trekkers. The sizes range from a weak Asian woman size to one who might have seen the inside of gym. The useless shirt is still in the bottom of a drawer. 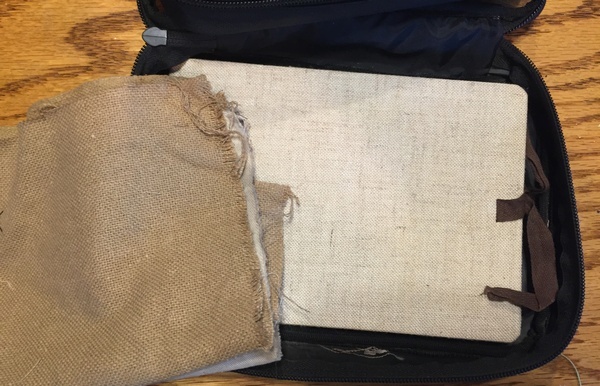 These travel bags were used for many years to hold the bits I needed to process soils into pigments for watercolors. They were filled with the evidence of that. 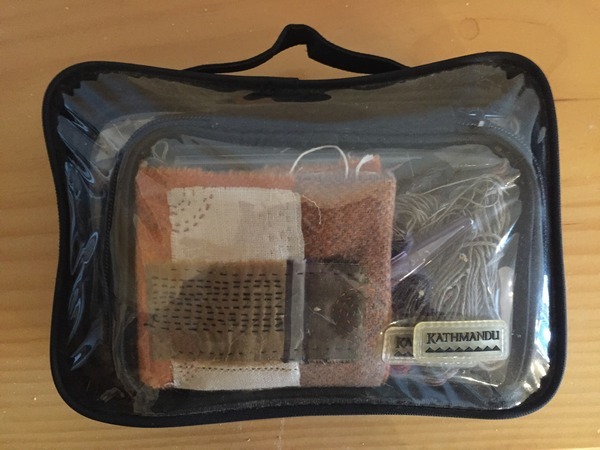 But when I saw them I wondered if when cleaned up and filled with the varying parts needed for sewing small meditations, they would become one single carry bag that could go anywhere with me around the house. So what you see above is the smallest one on the left with the needle pin case, pen, pencil, scissors and threads. It sits on top of the open lid to the middle bag with different fabrics rolled up. 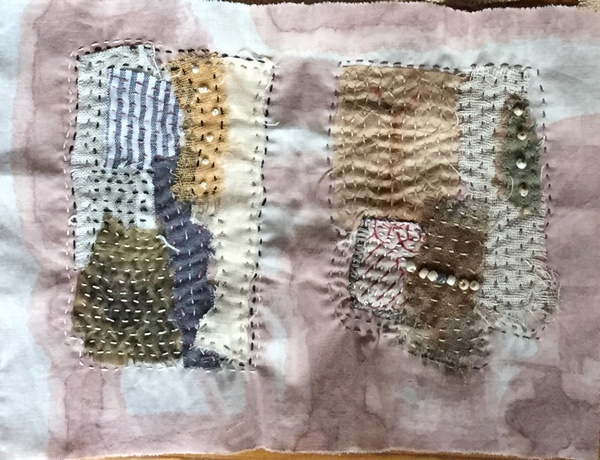 Some are scraps of old clothes, some of silks, some botanically dyed, some rough scrim that has been rusted and plain linens. Each bundle is rolled tightly and nestles in the pouch. That bag is sitting on top of the open lid of the largest one that holds a journal to write in and pieces of cloth folded in half. So rather than make up another object to do the job of something I already have, I am using this little bundle. Here it is closed. It is less than 9″ by 6″ and only 2.5″ when zipped closed. How handy is that! So I sat and stitched while sitting with Lee in the den. All I had to do was cut some bits of cloth, thread a needle, make that pesky knot on one end and hold all the pieces together where I pinned them. After two days I have this folio completed. They are meant to be folded in half like a book folio and the slightly larger beige silk will also be stitched on to then become the back side of the folio. Then if I make a book some day with all the pieces I won’t have to look at the backs. So these are the scraps saved for someday. These are the threads that I collected in every town in Australia that had a thread store for the sole purpose of keeping a record of all the colors I saw on the way there. These are the tiny scraps of silks dug out of bins at Beautiful Silks in Warnabool, VIC. These are the markings of my day in cloth and threads. And I will use the book to write a bit of a feeling, observation. I may not do this every day but it is so nice to know I have this small place to go and still be here. The only thing I added just this morning was a small container of beads that my threaded needle will pass through. Sometimes you just need a bead or two. As soon as the cleaning lady finishes cleaning around Lee in the den, I will head up there and pick up the little satchel, put on my glasses to thread the needle and maybe start the page that will back this one. Or maybe I will sit in the studio and look at all the things that I should be doing in there….all the books that need sorted….all the things I want to give away….packing my suitcase for Australia…. I did promise Robyn Gordon that I would send her a picture of my satchel, so I will put that on her page before I do anything else.